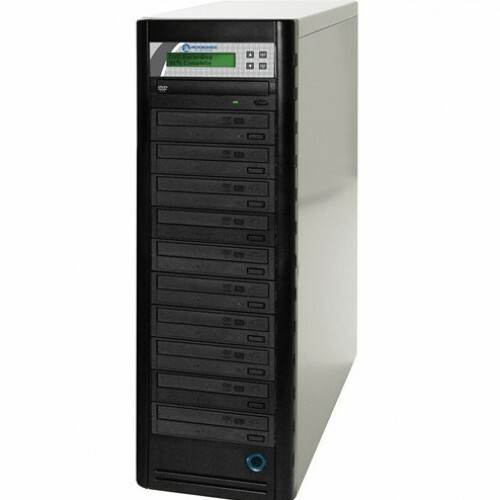 The LG 1:10 CD/DVD Duplicator is a DVD and CD duplicator that supports standalone operation. A USB 2.0 port is present on the unit, but only communicates with one of the device's DVD burners. The duplicator is perfect for any user requiring easy copying of audio, video or data DVDs or CDs. PrassiTech Zulu 2 disc mastering software is included. The tower can act as a standalone burner. Simply insert the CD you wish to copy from in the top drive and burn up to 10 copies simultaneously with the press of a button. The tower also includes a USB 2.0 port for computer control. You'll only be able to burn to a single drive via this method. This allows you to create the master disc from a computer source and then duplicate from the master via standalone operation. The burners record DVD-R discs at 22x speed and CD-R discs at 48x speed. This lets you burn a set of discs in a matter of minutes. This is great for anyone who has a large quantity of discs to duplicate.